Build and Rebuild the Mushroom Kingdom. 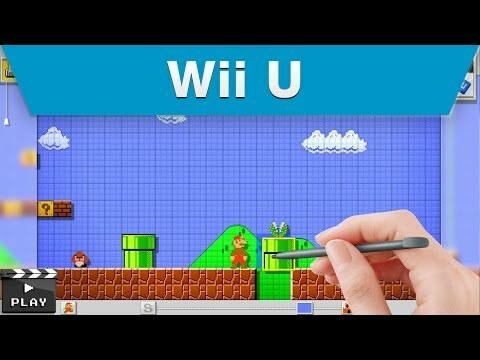 For the first time ever, anyone can create 2D Mario levels using Wii U GamePad controller. Making courses is easy. Players use the GamePad touch screen to easily drag and drop elements they want in their levels. Place blocks, pipes, lifts and enemies anywhere and play through the level. Want a Goomba to wear a Piranha Plant on its head, build a tower 10 Goombas tall or make a Piranha Plant fly by giving it wings? Players can instantly playtest and edit their creations on the fly. If something isn't working, go back into edit mode immediately by tapping a button and make tweaks until everything is just right. With the tap of an icon, users can even switch the visual style between a classic 8-bit Super Mario Bros. look and the HD world of New Super Mario Bros. U in the E3 version.